Canonburycreations: Let it snow, let it snow, let it snow!! I tried to show night and day and hope we don't have too many days or nights looking out at this!!! Hope you are having a great weekend wherever you are and a big welcome to Viv who has kindly decided to follow me. You certainly have had a busy week, Val!! And now you are going to become a recording artist!! WOW!! We met Craig Revel Horwood on our cruise in May. He wad a lovely guy.....not at all like he 'acts' on Strictly. It was a Strictly Come Dancing Themed cruise. There were all the costumes from the 2012 shows on maniquins all around the ship. Darcey Bussell along with James and Ola Jordan also joined the last leg of the cruise in Gibraltar. Wow what a week you have had sounds like you had a great week. What amazing news about the choir I certainly will want your autograph ! Fabulous pages too love all of that gorgeous embossing and the wonderful images. Beautiful snowy pages - love all the detail! Beautiful snowy pages, love how you did night and day. Wonderful pages love the textures, sounds like you have had a fabulous time and good luck with the recording. 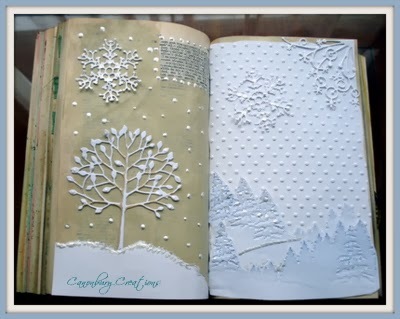 Beautiful snow page, love the die cuts and embossing. Love your page! The combination of swiss dots embossing, tree scene and die-cuts is inspired.